Filmmaker E. Bonnie Boykin, the creative responsible for one of 2016's most delightful gems from the independent horror circuit Afterbirth (watch here) is back developing another project that's much darker than her inaugural piece. 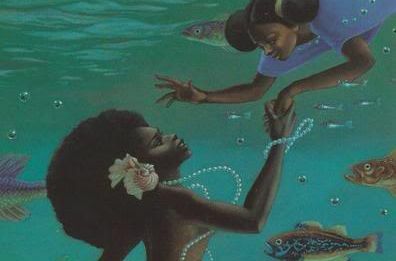 Mary Belle & The Mermaid is a horror-charged, pro-Black fem folktale about "a struggling artist's stroke of luck [turning] into a murderous obsession with a morbid river folktale." Mary Belle is inspired by its title namesake from Her Stories: African American Folktales, Fairy Tales, and True Tales by Virginia Hamilton which features all manner of supernatural narratives with care to the Black and female experience in America. Boykin's re-imagining will place the film's protagonist right in the middle of modern day New York City with the challenges of both mental and financial stability. Boykin promises a "mind bending, trippy, and creepy" short that I am definitely excited to see. Think I've just written the most important story I've attempted, ever. Can't wait to film this and have everyone see it. Right now Mary Belle needs our support on Kickstarter with a modest $300.00 goal. If you're in the NYC area, Boykin is additionally in need of crew members with lighting effects experience, a director of photography, or if you have production equipment for loan. Donate and spread the word!